Homecrest® Outdoor Living respects your privacy and works to safeguard your personal data. We realize that you may have questions concerning the confidentiality of information collected. Homecrest® Outdoor Living does not share, disclose or sell any personally identifiable information (such as your name, address, telephone number or e-mail address) collected online on www.homecrest.com with other unaffiliated companies or organizations for non-Homecrest® Outdoor Living marketing purposes. 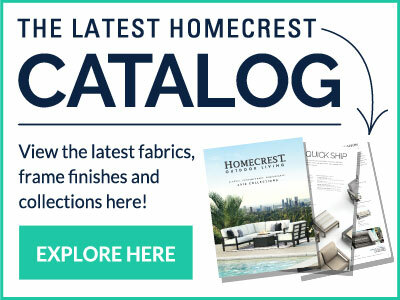 Homecrest® Outdoor Living collects information online through form submissions and email requests. A customer's name, address (postal and e-mail) and telephone number are the most important pieces of information, but we might request other information, based on, for example, the product(s) being ordered or promoted. Homecrest® Outdoor Living may also use "cookies" and similar technology to obtain information about your visits to our sites or your responses to e-mail from us - both individually and in aggregated data that does not identify you. These reporting tools tell us the parts of our websites or e-mails in which you showed an interest or took some action, and help us improve the quality and usefulness of our sites. While cookies help us improve your experience while visiting our sites and customize our communications to the services you may desire, you have the option to block them through your Internet browser or other commercially available software. However, doing so may make some of our sites' features unavailable to you. We use encryption, firewalls and other technology and security procedures to help protect the accuracy and security of your personal information and prevent unauthorized access or improper use.